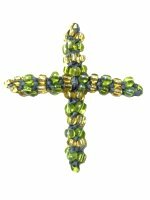 Description: The Beaded Cross features Crown Knots, which allow beads to be added to the cords. 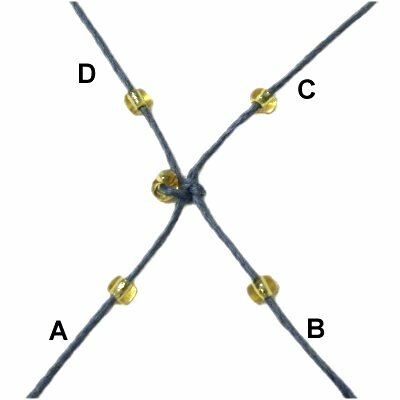 I recommend that beginners make the Cross Pendant first, since it has the same design. It's a real challenge to tie the Crown knots with fine material, tiny beads, and few pins. For that reason, this Micro-Macrame project is rated moderate. 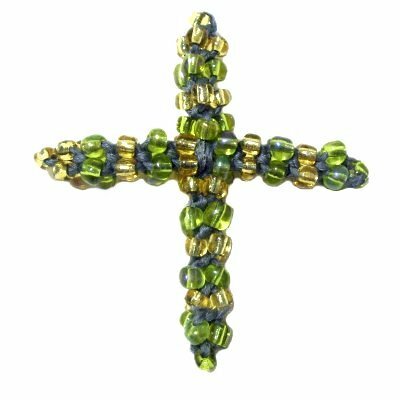 You will start by making the horizontal portion of the Beaded Cross. 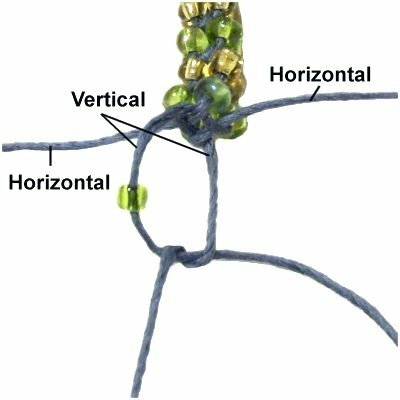 The first step is to tie a Shamrock Knot, which is two Overhand Knots linked in a specific way. 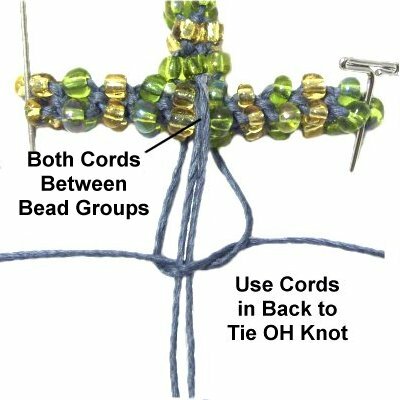 Other decorative knots can be used, but make sure the cords will head in four different directions after they are tightened. Preparation: Cut 4 cords, each at least 30 inches long. Prepare the tips with GLUE to stiffen the material for beading. I recommend you use Hemp, Bamboo, or other slightly stiff cord material. Cotton may be too flexible, depending on the type. Don't use slippery materials like Nylon and Satin. In the example shown, Bamboo cord was used to make the Beaded Cross. Step 1: Place a bead in the center of one cord. 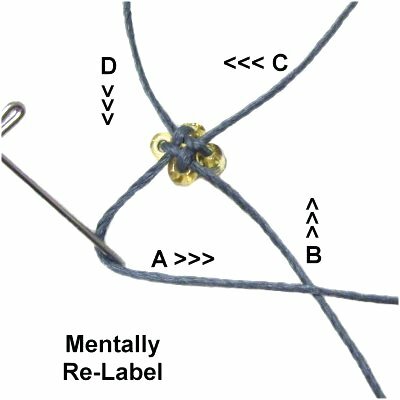 Tie an Overhand knot, but don't tighten it. Arrange it on your board as shown, with the bead forward. Designer's Tip: The term "forward" means the cord, segment, or bead is heading toward the front of the board. The term "backward" or "behind" means it's heading towards the back of the board. 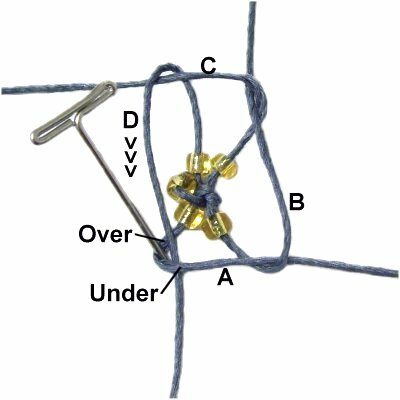 Place a pin near the crossed area of the Overhand Knot. Arrange a second cord around it, so the center is next to the pin. 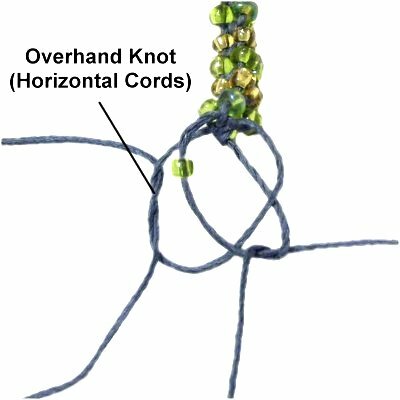 Pass the left half of the cord through the Overhand knot, so it's under the crossed area and over the area where the bead is resting (crook). 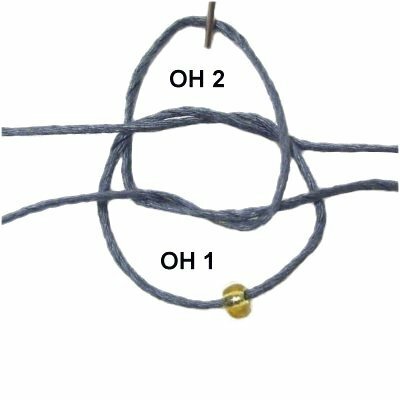 Tie an Overhand knot with the second cord (OH 2). 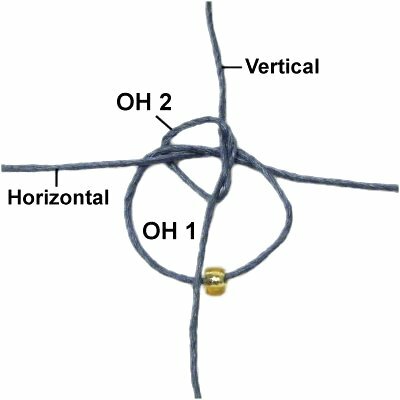 The crossed area should be inside the first knot (OH 1). Turn the second Overhand knot so the two halves of the cord are vertical, then tighten it. 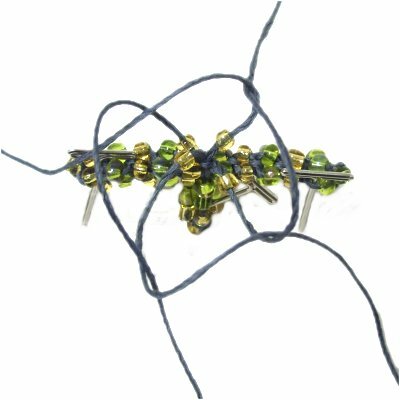 Tighten the first Overhand knot, making sure the two halves are horizontal as you pull them. Step 2: Arrange the cords diagonally as shown. Mentally label them, starting with the lower left segment (counter-clockwise). Slide one bead onto each cord. Push them close to the first bead. 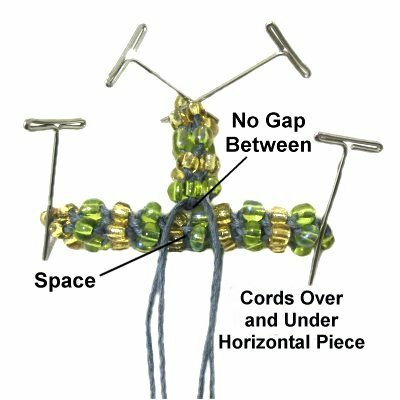 Designer's Tip: You can allow the first bead to rest beside the Overhand knots. Later you will need to turn the bead into the proper position under the knots. The most challenging part of the Beaded Cross is figuring out how to secure the cords. At this stage, do not try to secure them at the center. They just get in the way. I recommend you use tape, or place the pins at an angle and lean them over the cords. Step 3: Fold segment A around a pin, then to the right, over segment B. It should be horizontal. The pin will help keep a small space open, and helps to secure the cord if you lean it left. Fold segment B vertically, passing over segments A and C.
Fold segment C horizontally to the left, passing over segments B and D.
Fold segment D forward vertically, passing over segment C.
Bring it through the secured corner of segment A, passing over - under the two parts. 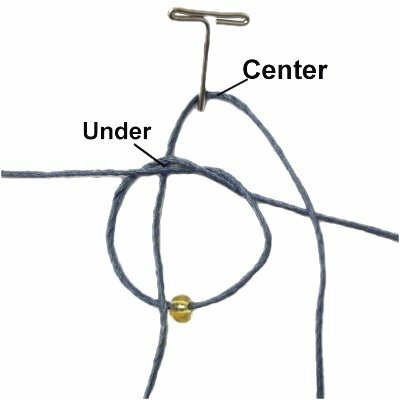 Tighten the Crown Knot by pulling on all four segments gradually. 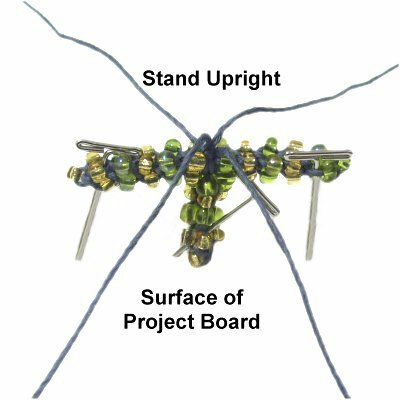 The beads should rest below the knot, so you may need to LIFT the cords off the project board while tightening. The first bead should be underneath the group of four, so re-arrange it now. Step 4: Mentally re-label the cords, starting with the left lower segment (A). 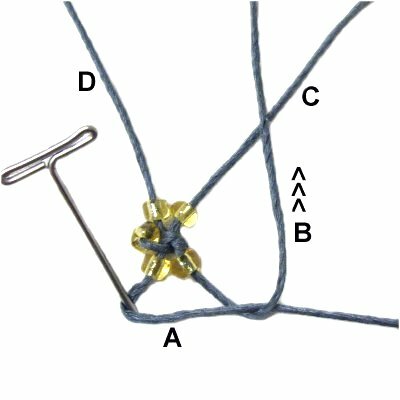 Repeat step 3, tying another Crown knot, but do not add any new beads. Tighten it firmly. 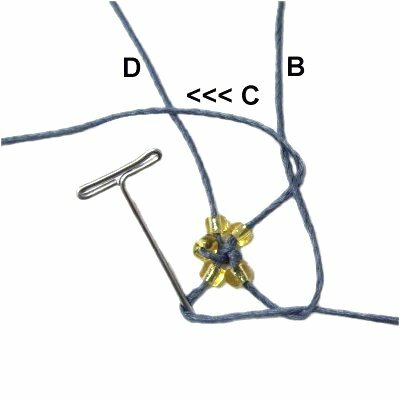 This extra knot will help keep the previous knot tight, which makes the Beaded Cross more stable. Step 5: Add beads to all four segments, then mentally re-label them. 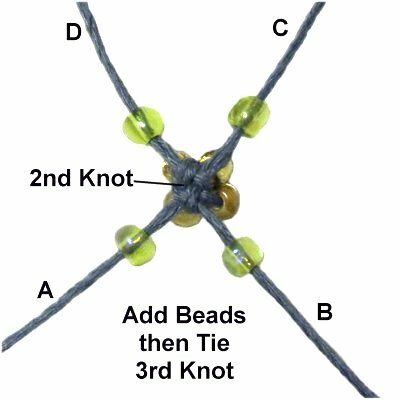 Repeat step 3 to tie the next knot. Lift the cords when tightening, so the beads rest below it. Step 5, continued: Repeat steps 4 and 5 eight times, until there's a total of 10 groups of four beads. The horizontal portion will be around 2 inches long. To make the Beaded Cross smaller, reduce the number of bead groups to 8. To make it larger, increase to 12 groups. 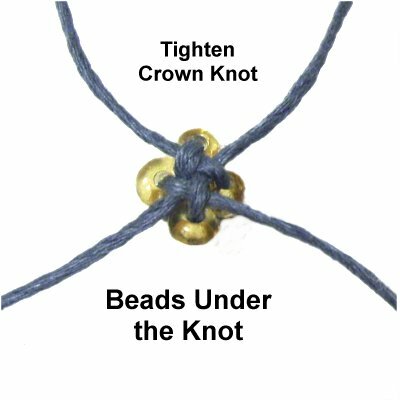 Important: After the 10th group of beads is attached with the Crown knot, do not tie the extra knot (step 4). Step 6: Lay the beaded design on the board with two cords vertical and two horizontal. Slide a bead onto the top vertical cord. That's the one not resting on the board. 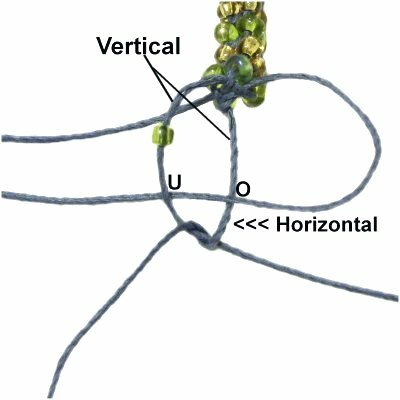 Tie an Overhand knot with both vertical cords. It should rest sideways as shown in this image. 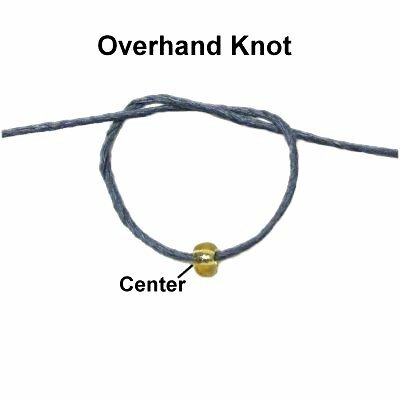 Pass the horizontal cord on the right through the Overhand knot. That's over the lower vertical cord and under the top cord with the bead. Tie the two horizontal cords together to make the second Overhand knot. Tighten it first, followed by the one made with the vertical cords. Apply glue as you are tightening. When it's dry, cut off the excess material. Step 7: Repeat steps 1 and 2 to start the vertical portion of the Beaded Cross. Repeat steps 3 - 5 until there are four groups of beads. The design will be almost 1-inch long. 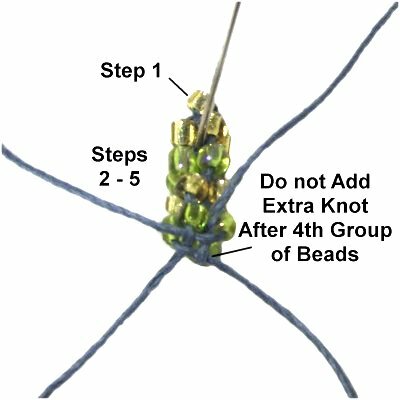 Do not add the extra knot after the 4th group of beads (step 4). Step 7, continued: Secure the short vertical portion flat on your board, with the cords heading towards you (forward). Place the horizontal portion of the Beaded Cross next to the vertical portion. There should be no gap between them. Two cords should rest over the top of the horizontal piece, and two should rest under it. Locate the space between bead groups 5 and 6. Designer's Tip: Measure the horizontal piece to be certain the space is actually in the center of it, especially if you made that piece with a different number of bead groups (8 or 12). Put both cords in the space between the bead groups, in the front and back areas of the horizontal piece. Use the cords in the back to tie an Overhand knot around the cords on top of the piece. Tighten it firmly. Step 8: Secure the finished portions of the Beaded Cross so they are upright. Placing pins through the horizontal piece vertically really help to stabilize the design. Step 9: Repeat steps 3 - 5 after sliding one bead onto each cord. You should make at least 6 - 8 groups of beads. 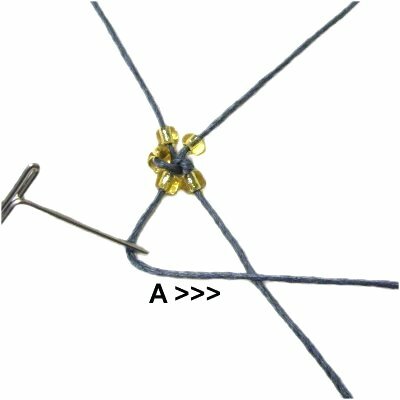 Don't forget the extra knot between them (step 4). Step 10: Repeat step 6 to complete the vertical portion of the Beaded Cross. Apply glue when tightening, and when it's dry, cut off the excess material. Step 11: To attach the cords to make a necklace, just tie an Overhand knot at the center, and slide it over the top portion of the cross. It's better to attach only one cord to the cross. Add any extras you need for the necklace by tying them onto the first cord. Have any comments about the Beaded Cross? Contact Me.